Mannlicher M 1895 Colonial (KNIL)rifle . No s#. Excellent blued double edged slim blade with no markings. Excellent blued square pommel and crossguard with hooked quillon and muzzle ring; MRD 14,5 mm. Excellent black composite grips secured to the tang by two large bright metal rivets. 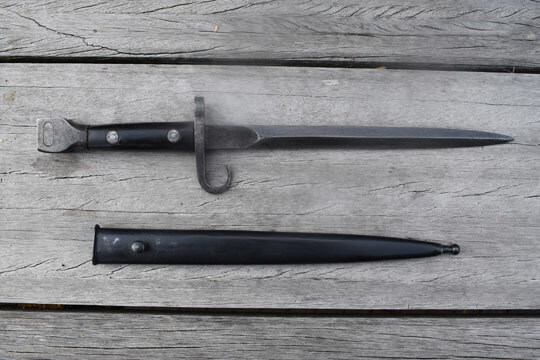 Very good and correct all metal blackened scabbard with round frog stud and ferulle. No dents! Believed to be made in Indonisian arsenals under suppervision of the TNI rebels shortly after the caputilation of the Netherlands in 1944. Extremely rare bayonet, seldom seen in a good condition. Total lenght 37,4 cm.